Today was filled with adventure despite the stress of schoolwork. We had gone on a dive at Dairy Bull reef earlier in the morning and saw a sea turtle. Back on dry land we began to feel the heat of assignments and upcoming exams. To cool off we ventured out on a dive in the afternoon. Our professor Brad told us about a cavern that had a unique feature, so we headed there to see what it had to offer us. 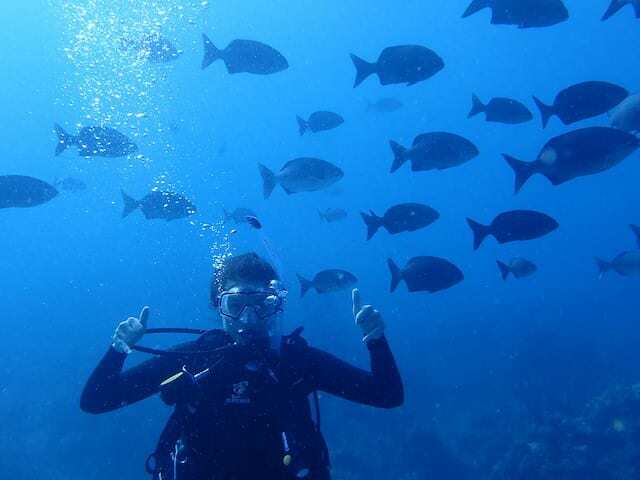 We rounded up a bunch of divers and made a speedy getaway to our location. With all of us geared up, we began our descent and made our way towards the cavern. As we were approaching, the sunlight that was trickling down on us became obscured. I looked up in shock to find massive fish larger than my head circling around us. Bermuda Chubs were schooling all around us trying to see what we were and if we brought any treats for them. My fear melted away into awe as I watched these monstrous fish dance around us. They were so close that I was able to reach out and touch them as they swam past. The Chubs followed us on our journey to the secret spot my professor was raving about. At 50ft down there was a birdbath with benches in a circle that were anchored to the bottom. In the birdbath was a collection of bottles that were weighed down, so they wouldn’t float away. It was as if someone knew we were headed there and left out some refreshments for us. My friends and I decided it was the perfect place to relax from all our hard work and had ourselves a drink. 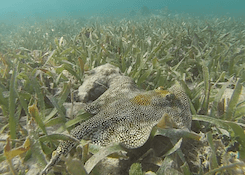 15 Jan 2019 – It’s a great day to dive! Yesterday on the 15th I was trying to take it easy in the water and hit the books to work on studying and some assignments we have in our last few days in Discovery Bay. That didn’t last long…. Hesitant at first to go on a dive, Professor Peterson reminded me to have some fun and that I wouldn’t regret going out on the boat- and he wasn’t wrong! On the way to explore a new dive site we rode through a school of flying fish. Although I don’t have any pictures of the experience, I can only explain it as I thought it was a bunch of birds gliding along the water. The flying fish can glide very far, and their “wings” actually resemble a birds fairly well. I didn’t spot any flying fish underwater, but 40 feet below rather I saw a large diversity of other fish and was not disappointed. One fish I haven’t seen before yesterday was called a “chub” (Kyphosus sectatrix) and they were very friendly. Once they saw a group of us divers they schooled around us and swam side by side with me and my dive buddies. I assume they believed we were large predators and they’d get scraps from us, but they stayed with us nonetheless when they didn’t get any food. A picture my friend, Siobhan, took of me with a school of Chubs. After finding an arrow crab (Stenorhynchus seticornis), my dive buddies and I took turns passing him around. Seemingly content with being handled we took some pictures. Arrow crabs are one of the few species of crabs I don’t mind handling because their pinchers are too small to cause any damage. They are often smaller and blend in really well to the rocks and crevices, so spotting one is always fun. 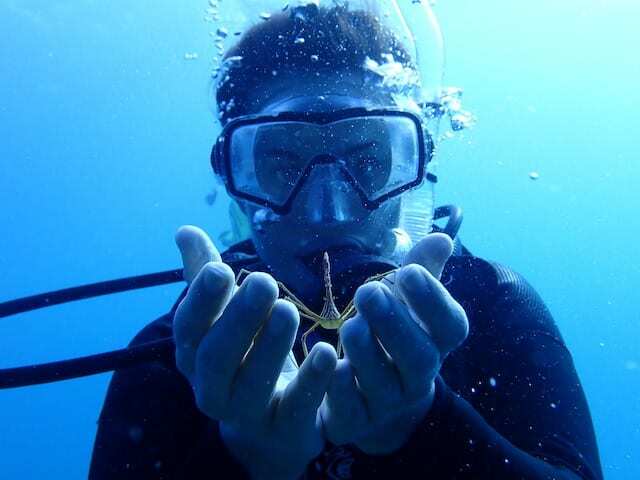 Siobhan is great at taking pictures of us all while diving and captured another great sot of me holding my arrow crab friend. After the dive we headed back to the boat, all in great spirits! Siobhan was taking a picture of me at the surface with a beautiful resort behind me, but I got photobombed by Professor Peterson as he was snorkeling by. 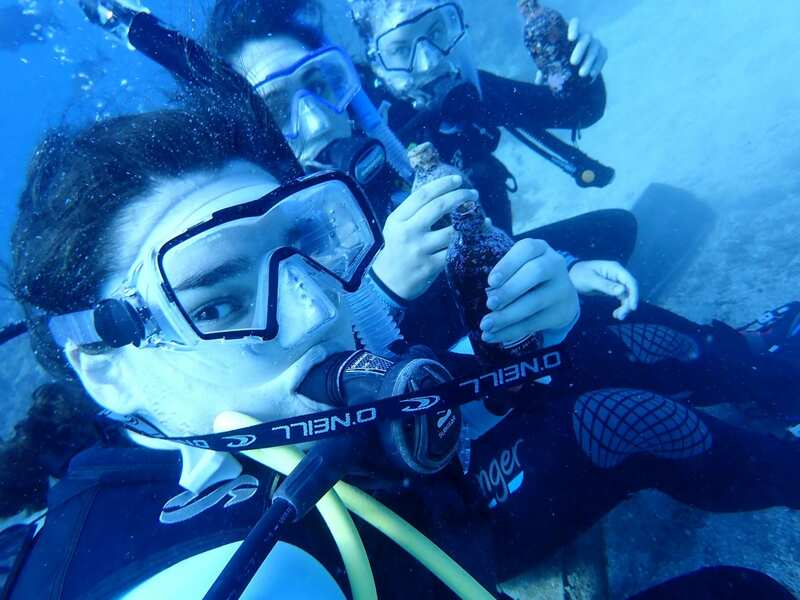 I won’t complain- it’s not everyday someone gets to go diving with and photobombed by their professor snorkeling by! Professor Peterson photobombing my surface picture after a great dive. 15 Jan 2019 – Jamaican Me Crazy! There’s about four more days left of this journey and tensions are a bit high. We are all a little bit irritable because of all the assignments due and upcoming examinations. There’s been a higher frequency of arguments between the students this week. I guess we are driving each other a bit crazy lately. Memorizing the scientific names and identifying dozens of species can put a lot of people under pressure and I totally understand that. However, I really wish people weren’t so stressed. I mean, we are in Jamaica! Peace, love, and respect, mon! In retrospect, we have had so many great adventures. I’ve gotten awesome footage of climbing waterfalls and snorkeling over reefs. I’ve been making so many great friends and meeting many different new people. The employees working at Discovery Bay Marine Lab are probably some of the nicest people I’ve ever met, a lot nicer than people I’ve met in New York City! I am kind of sad that this adventure is coming to an end. I’ve been having so much fun. I am very happy to be going home, though. I miss my friends, my family, and my dogs so much. However, I am not missing the snow! It’ll probably take me a while to adjust back to the cold weather, but at least I’ll have a nice tan to last me throughout the rest of the harsh winter! I am very thankful to have had this experience. Although I might feel a little bit stressed now, I know that in a few months I will look back and only remember the great times I had on this trip. 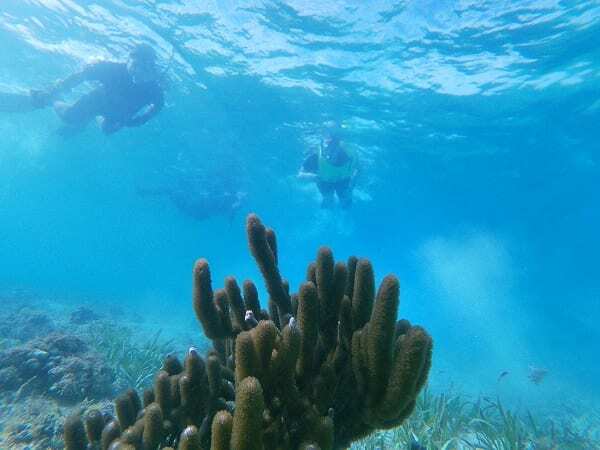 Maybe someday I will come back to Jamaica and be able to impress my friends and family with my extensive knowledge of Tropical Marine Ecology! Here is a picture of a sponge with my friends Lucas, Avocado Andrew and Asparagus Andrew in the background. 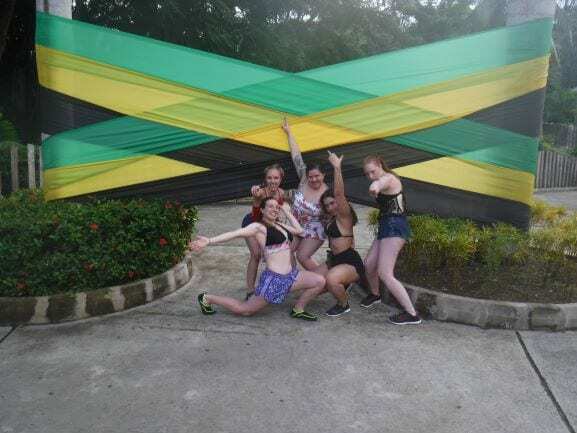 15 Jan 2019 – Jamming in Jamaica! Hi everyone! The past couple of days have been so busy! 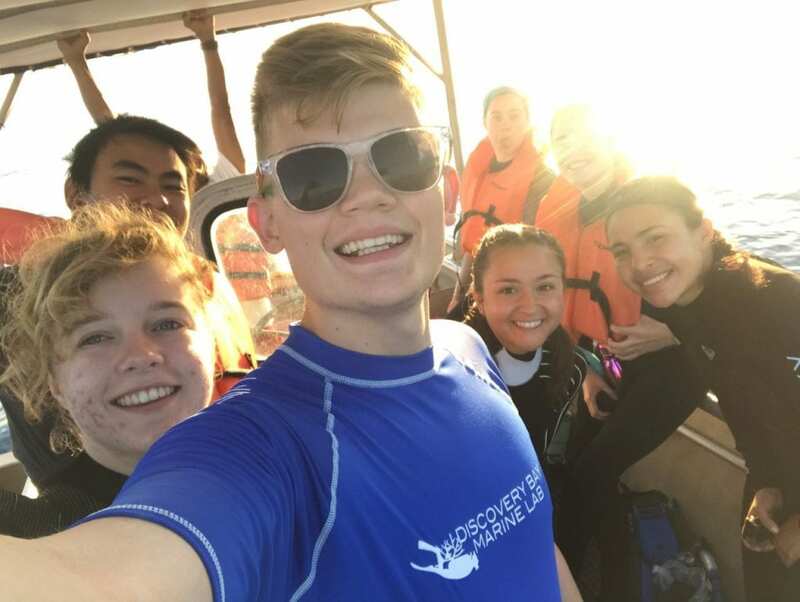 Today we went to the east coast of discovery bay on a snorkel trip around 7am and we got to see a lot of hydrocorals and fish. It’s an awesome experience to be able to look at all of the different parts of discovery bay and get to see the differences. In the afternoon a few of the other students and I were invited on a research excursion to help collect sediments for analysis later today. It was so much fun to go out and practice the field work! As a molecular biology student this trip has provided both a relaxing yet also thrilling change of pace. As the winter semester comes to a close and the final projects are starting to be submitted, I can’t help but I think how much I am going to miss my little Stony Brook family! It was such an honor to be picked to go on this trip. Everyone has become so close over such a short period of time and I have already begun making future plans to visit the friends I’ve made here in Long Island! 14 Jan 2019 – And the Research Begins! 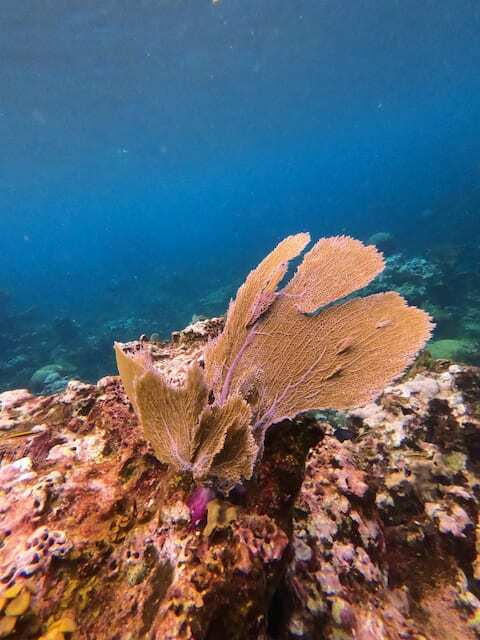 So today we began to help in continuation of research done here in Discovery Bay regarding the state of the reef. 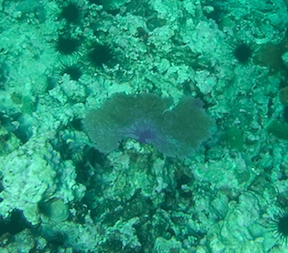 During the 1990s, a team of scientists, Richardson B. Aronson and William F. Pretcht, began conducting transect-like recordings to help distinguish the densities of herbivores, including Urchins, Surgeonfish and Parrotfish, as well as the seafloor habitat, mainly regarding if it included sand, coral, or algae. 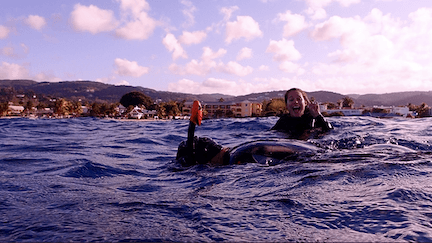 As of 2012, our professors Dr. Bradley Peterson and Dr. Joseph Warren, as well as their previous student Dr. Amber Stubler, began to continue Aronson and Pretch’s research in Discovery Bay, Jamaica. In order to partake in this continuation, my classmates and I took out tape measures to measure 5m linear point intersections which we used to count up herbivores and the bottom structures in various locations. 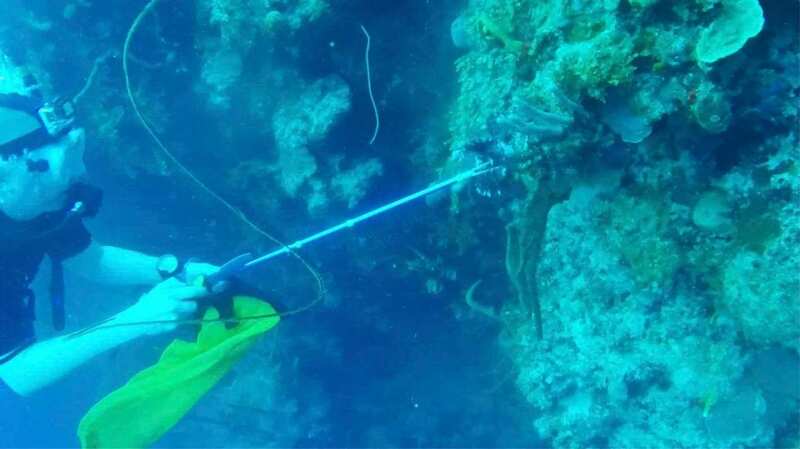 Originally my group thought this procedure would be fairly simple, especially since we were divers so we could stay under the water, however it did not turn out that way. Trying to make our way out into the bay with our heavy gear on, against a decent current, and then balancing in almost 4 feet of water, trying not to stand and harm the habitats underneath, was as hard as it sounds. Due to these difficulties, we could not finish the linear intersection recordings we had planned out. Of course, setbacks like these happen in research when you are in the elements where everything is unpredictable. 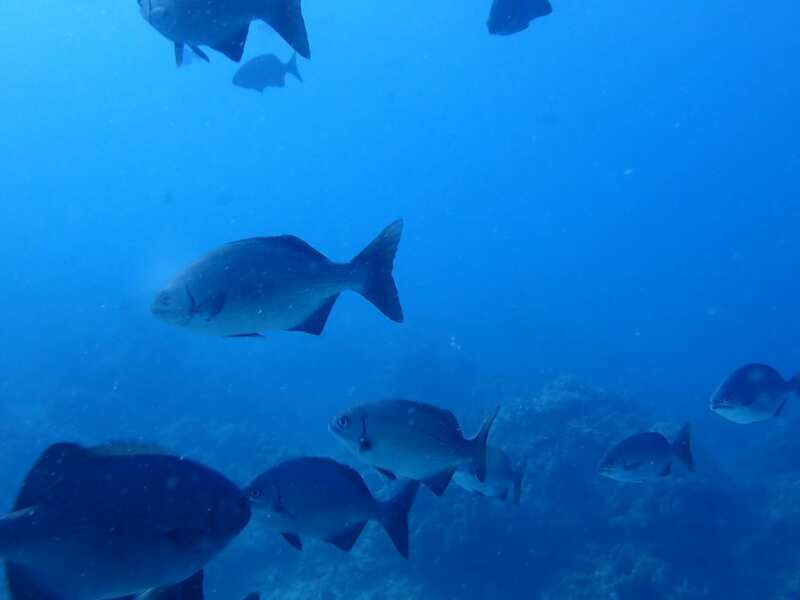 Therefore, we decided to continue our recordings by snorkel tomorrow, which hopefully will allow us to finish and analyze our findings against previous data. So even though today was slightly disheartening, I am still very excited to continue and compare this year’s data to previous years, allowing us to see how well the reef is doing. 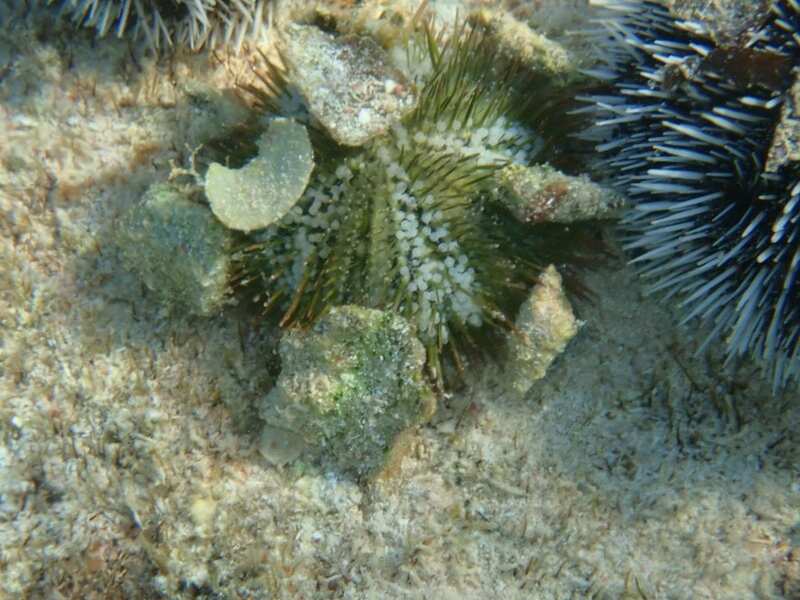 One of the green urchins counted during our assessment of the reef! Credits Siobhan. 1-13-19; ~4:00pm. 14 Jan 2019 – Day 9 – What Kind of Adventure is This? The best I could ever ask for, that’s what! This trip has been going along wonderfully. Once I figured out the problem with my mask was simply not enough de-fogger in my mask, I could snorkel and dive much more smoothly. 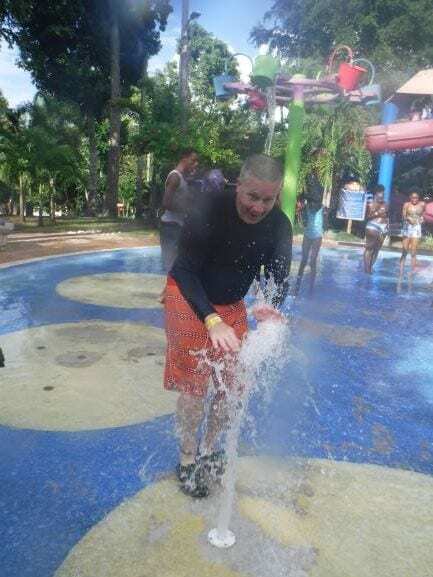 I have greatly enjoyed every excursion we’ve done, from watching our professor impaling invasive Lionfish to going on a very successful scavenger hunt to find as many things as we could to climbing a waterfall to measuring transects in water way too shallow for my liking (during which some of us got “charged” by a Spotted scorpionfish… jeez that was scary! )… Man this trip has been such a blast so far! I cannot wait to share my experience with other people in person, and I am certain this will be a time to remember! 13 Jan 2019 – A Day Off! Our time here in Jamaica has been fun, but intense. We’ve been having about two lectures a day, in out of the water, and there’s a lot to study. We’re also working on identification projects; compiling our photos of reef creatures and algae and learning their scientific names (Abudefdef saxatillus might be my favorite fish). We’re in a beautiful place, but it’s no beach day. Saturday was different, though. 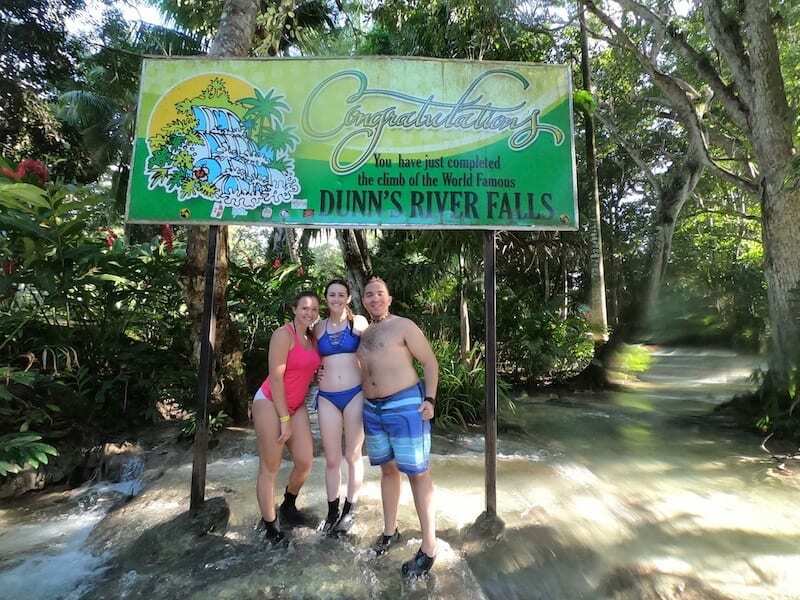 The day started with a brief storm and choppy waters (not good for diving or snorkeling) and we were set to head out to Dunn’s river waterfall and Ocho Rios in the afternoon. So, what are us students to do but pass the time with volleyball? 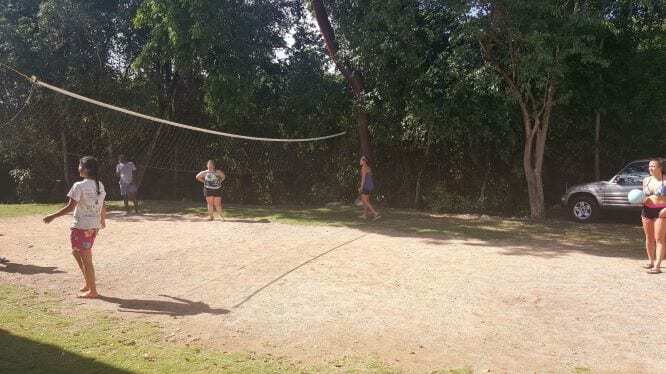 The volley court right outside our dorms. Not all of us are athletes, but we had fun anyway. I was even given pointers from people who knew what they were doing. We had to constantly retrieve the ball from the hilly mangroves; that became a game itself. I have been studying next to my classmates for a week now, but here I had the opportunity to bond with people outside of my roommates. We played until were sweating and tired, but we didn’t want to stop. We had a nice break yesterday, and I as I type this we are studying by the water, ready for learning research techniques.